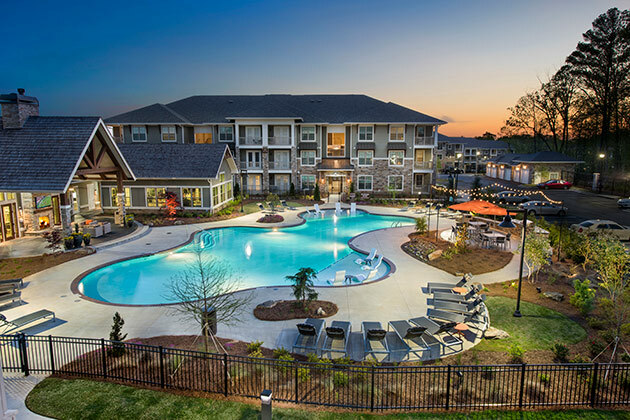 Walker & Dunlop, Inc. announced today that its investment sales group, Walker & Dunlop Investment Sales, LLC (“WDIS”) closed the sale of Stadium Walk and Overlook at Huntcrest, two multifamily properties located in Atlanta, Georgia. The two transactions were completed on behalf of Brand Properties and totaled nearly $133,000,000. Situated in a nation-leading employment hub, Stadium Walk and Overlook at Huntcrest represent an unparalleled multifamily investment opportunity in a booming city. Since the Great Recession, Atlanta’s suburban renter base has grown faster than any other suburbia or city center in the United States. Atlanta’s diverse economy, relatively low cost of living, abundance of well-paying jobs and high quality of life have enabled the city to maintain this high level of population growth. Led by Kris Mikkelsen and Chris Goldsmith, WDIS’ Southeastern team represented the seller, Brand Properties, in the sale to Blaze Partners. Following the sale, the company’s multifamily finance and capital markets team, led by Stephen West, Matthew Wallach and Justin Nelson, arranged financing for the buyer’s acquisition. Stadium Walk, a 309-unit, Class A luxury community is located in the Cumberland submarket of Cobb County. The high-density surface parked community is within walking distance of The Battery Atlanta, a $2 billion mixed-use development and home of the Atlanta Braves. Overlook at Huntcrest is a 299-unit, garden-style apartment community located in the Sugarloaf submarket of Gwinnett County, one of Atlanta’s most affluent communities. Area residents benefit from strong public schools, upscale shopping, cultural venues and ample recreational opportunities. “Brand Properties delivered two excellent long-term investments in submarkets poised for continued growth and success. Blaze and their equity partner recognized the challenges related to additional multifamily development in both municipalities and the long-term growth prospects that come with those barriers to entry.” Mr. Mikkelsen commented. WDIS is a leader in the multifamily brokerage space and continues to expand its capabilities and reach across the United States. In 2018, the team expanded its footprint to several new markets, including Boston, Dallas, and Southern California. To learn more about Walker & Dunlop’s investment sales capabilities, visit our website.